Our thanks to the American Battlefield Trust for bringing their Generations event to Cedar Mountain! A good time was had by all, and it was wonderful to see multiple generations — kids of all ages, parents, and grandparents — learning about the Civil War in this fun and interactive experience led by ABT’s Gary Adelman. We very much appreciate the efforts of the ABT staff members who helped make this event a success, and our thanks to everyone who participated! After a mock battle, some members of the Federal and Confederate lines graciously came together for a group photo. Read the Culpeper Star Exponent article about Cedar Mountain Battlefield’s Generations event. RAPIDAN—Children dressed in little Union soldier uniforms—and regular modern street clothes—confronted a whooping Confederate line on a windy Sunday morning at the Cedar Mountain Battlefield along U.S. 15 in southern Culpeper County. “For your homes, for Virginia!” rang out the Rebel call as both sides hurled plastic balls at the other and gusts carried the light spheres into the air, a few striking their intended targets. “Let’s get so close to them to kill them all!” shouted one youngster in blue, the tactical lines shifting all around the grassy field overlooking the mountain for which the Aug. 9, 1862, Civil War battle at the site was named. Like the actual battle here 157 years ago, the Union line that also included parents and grandparents eventually retreated. The Confederate line, with its similar makeup, overtook them as part of the weekend’s interactive “Generations” event hosted by Washington, D.C.-based American Battlefield Trust. The Trust provided the period outfits for the smallest participants, including a straw hat and flowered apron for one little girl. The Trust owns more than 150 acres at the battleground where nearly 3,700 men were injured or killed. It was a “quick, brutal fight” in temperatures that soared to 98 degrees, Kris White of the Trust told an assembled crowd of more than 100 prior to the battle simulation. Outnumbered two to one, Union forces were pushed back to Culpeper following a Confederate counterattack led by native son, Maj. Gen. A.P. Hill. It was at Cedar Mountain where the famed Stonewall Jackson drew his sword, nearly rusted to the scabbard for lack of use, for the only time during the war to rally his troops. It is also where Clara Barton performed her first official duty, tending to wounded on the battlefield in the days after the fight, though the Red Cross founder did not earn a mention during Sunday’s program. Intended to activate interest in history among young people, the Generations event attracted all ages and drew people from near and far. Joanne Price, of Bel Air, Md., visited Cedar Mountain with her husband, son, daughter-in-law and grandson, 12-year-old Tyler. “We are history buffs,” said Mrs. Price. “Who goes to Gettysburg on July 3? I do. The wool blend blue coat may have been a bit much for her grandson. “Grandma, I’m sweating,” he told her. But the uncomfortable attire didn’t stop him from enjoying the event. “It’s pretty cool; you get to throw stuff at people,” Tyler said after. Asked what he learned, the sixth-grader at Magnolia Middle School in Joppa, Md., responded that the tactical formations were something new. “I didn’t know they had to stand in lines on the battlefield,” he said. He added he enjoyed visiting Culpeper for the weekend. “It’s like real old and historic,” he added. His father, Rich Price, said his interest in battlefield history was born from his own father’s interest. A half-dozen re-enactors in gray, representing the Valley Guards, participated in the day’s activities and demonstrated what life would have been like at camp and on the battlefield. The actual Valley Guard was part of the 10th Virginia Volunteer Infantry Regiment, a militia that organized in the late 1850s in Rockingham County. The unit suffered 43 casualties in the 1862 battle at Cedar Mountain. On Sunday, the smell of campfire drifted with the wind and so did smoke from Confederate guns booming from the farm field. Dark clouds eventually rolled away, revealing blue sky and sunshine. “One of the main things we get out of this lifestyle is interacting with people, with you,” said Patrick Heelen of Culpeper, one of the Valley Guards. “We love history, but you can only get so much history out of a book. The wool jacket worn by Civil War soldiers would have weighed around nine pounds, he said. It was part of battle gear that totaled up to 50 pounds and included three days rations, gun, blanket, canteen and cartridge box. Loading a musket was a 10-step process, Heelen added, demonstrating the process, further noting that a well-trained infantry man could get off three rounds per minute. Re-enactor Bobby Sapp wore his ancestor’s quilt wrapped around his body. He said it was the same quilt his ancestor was wearing when he was shot and killed at Gettysburg. With its squares of faded plaids, purple flowered material and bits of white stuffing exposed, the quilt rarely sees the light of day, he said. He said he re-enacts for the dozens of ancestors who fought for the Confederacy. Heavy on Confederate history, Sunday’s Generations event included brief mention that the “Fried Chicken Capital of the World” is town of Gordonsville, from where Confederate Gen. Robert E. Lee’s army marched to fight at Cedar Mountain. Not mentioned was the fact that the town earned that name due to the African-American women who fixed and sold the delectable fare to feed train passengers passing through the war-torn area. Attendees at Cedar Mountain were instead offered a taste of “hardtack,” provisions for Civil War soldiers that, as its name implies, is nearly inedible. There were also little packets of Goldfish crackers and oranges for the kids. Participants at the local event donned 3D glasses to view bulging Civil War photos of dead horses and Union soldiers barely in their battlefield graves. The first photos of dead horses on an American battlefield were, in fact, taken at Cedar Mountain, Adelman said. Michael Snyder, a grandfather from Pottstown, Pa., agreed. He brought two grandsons with him to the Generations program, one from Long Island, N.Y. and the other from Lancaster, Pa.
“I wanted to bring them down because of this idea of how important it is to get the younger generation interested in Civil War history and preservation,” he said. Round bales of hay stand as sentinels in a snowy landscape with Cedar Mountain in the distance. Our thanks to Bud Clark for the photo. on Park Day, April 6, 2019! You will be part of a national effort to keep America’s battlefields and historic sites pristine to honor our nation’s history and provide memorable learning experiences and recreational enjoyment. HQ House at 9465 General Winder Rd, Rapidan, VA 22733, about 6 miles south of Culpeper on Rte 15. 8:30 am. Should I bring any tools or supplies? No, the event will be cancelled. Families, don’t miss the American Battlefield Trust’s Generations living history event at Cedar Mountain! Outmaneuver your opponent, eat some hardtack, smell the black powder and learn about the battle at Cedar Mountain on August 9, 1862. Free to all who come with a member of another generation to share this experience! If pro-tourism and pro-history people pick up the phone now and call Richmond, it sure couldn’t hurt. That’s one takeaway from interviews with backers of the Culpeper County battlefields state park, whose fate rests with lawmakers meeting in the capital. State Sens. Emmett Hanger and Sen. Bryce Reeves, Republicans representing Culpeper, have secured the Virginia Senate’s support for budget language directing the state Department of Conservation and Recreation to study creating a park at the Brandy Station and Cedar Mountain Battlefields and report back this fall. Now the question is how that idea will fare when powerful House and Senate conferees go behind closed doors, soon, to hammer out the state budget. The Virginia General Assembly’s winter session is set to adjourn by the end of next week. Express your support for the Brandy Station & Cedar Mountain State Park Alliance – click to call your Virginia legislator! With large solar projects on horizon, what is the value of historic views? Published August 21, 2018 by the Culpeper Star Exponent. Read article on starexponent.com or below. 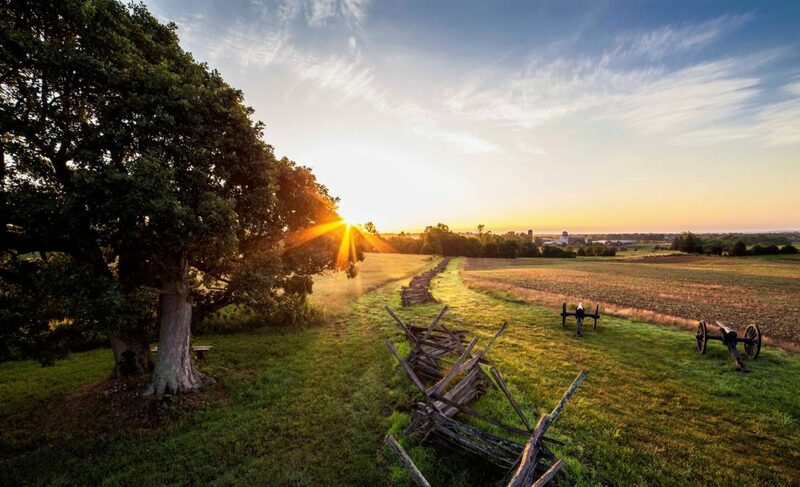 A recent study by the Washington, D.C.-based American Battlefield Trust provided its analysis of the impact large solar farms would have on some of this area’s most hallowed ground. Author Karen BoushiePosted on August 26, 2018 January 31, 2019 Categories Battlefield preservationLeave a comment on With large solar projects on horizon, what is the value of historic views?